"America’s #1 coloring book about drone warfare!" This darkly satirical coloring book presents an unusual invitation: get out your crayons and paintbrushes and add color to biting images featuring America’s preferred machinery of war: the drone. In these pages, you can set to work on coloring pictures of brilliant drone inventors, cutting-edge drone factories, patriotic drone companies, thankful drone victims, noble generals, brave politicians, budding drone pilots, and much more! 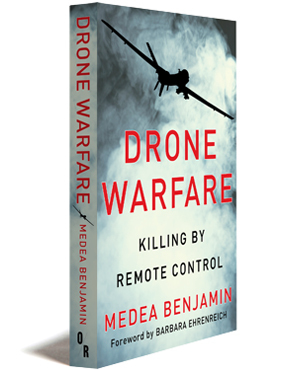 The American drone war experiment is a heroic enterprise in fighting evil. Its leaders freely and secretly target for assassination shadowy forces around the globe, all without the slightest danger to its pilots or inconvenience to its citizens. The only challenge is how a patriotic American can feel more involved in the glory of these unseen wars. Our answer—coloring! Color Me Drone Warfare! is a work of the Cluster Project, an artist collaborative that produces multimedia art works exploring the universe of contemporary warfare.